RAV4’s standard 2.5-liter 4-cylinder DOHC engine develops 176 horsepower and 172 lb.-ft. of torque for brisk acceleration and great drivability. And with its Dual Variable Valve Timing with intelligence (VVT-i) technology, it gets surprising fuel economy too. How far is that next gas station, anyway? RAV4’s ECO Mode changes the accelerator input and air conditioning/climate control parameters when you need greater fuel efficiency. RAV4’s suspension has been tuned to provide a smoother ride on the highway, yet offers the same rugged reliability when the going gets rough. The 2015 RAV4 is ready to help make your days, and nights, more fun. With expressive styling and a roomy, comfortable interior, RAV4 is decidedly refined—but with agile handling and all-weather capability, it’s ready for fun-filled adventure whenever you are. Carry your stuff in style. 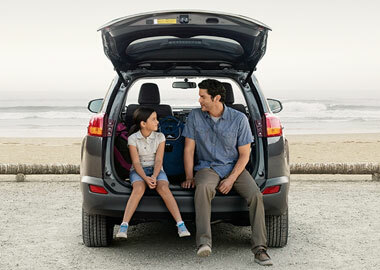 With its spare tire mounted underneath the cargo floor, RAV4 is as versatile as it is good-looking. The liftgate opens up instead of out, so it’s easier to load up with all sorts of stuff. And now standard on RAV4 Limited and available on XLE is a power liftgate with jam protection that also offers height adjustment. The outside mirrors and taillights incorporate small bumps called vortex generators, which help direct airflow around the vehicle for greater stability at highway speeds. RAV4's interior offers a superior level of refinement, with available French stitching and soft-touch materials throughout. This tailored craftsmanship extends to the dynamic dash, which incorporates a standard Entune™ Audio system with 6.1-in. touch-screen, speedometer/tachometer and Multi-Information Display. The cool blue glow of RAV4’s instrument cluster makes it easy to find the info that you need. 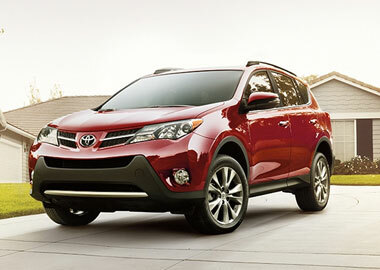 RAV4 Limited helps you customize your comfort. Standard multi-stage heated SofTex®-trimmed front seats help tame those chilly nights. And finding the perfect driving position is never an issue, thanks to an 8-way power-adjustable driver’s seat with memory function and power lumbar support. RAV4’s standard tilt/telescopic steering wheel features integrated controls for the things you use most, like the audio system, Bluetooth®, hands-free phone and Multi-Information Display. And with satin silver inlays and raised grips, it adds plenty of style. Comfortable passengers are happy passengers. This available system lets you and your front passenger regulate your own environments with individual temperature control. Connect with the wonders of Mother Nature by opening the standard power tilt/slide moonroof on RAV4 XLE and Limited models. This feature also includes a sliding sunshade to help keep you protected when the sun is directly overhead. RAV4 offers two available audio systems that incorporate navigation, so you can have a soundtrack to accompany you on your adventures. Choose from Entune™ Premium Audio with Navigation and App Suite and Entune™ Premium JBL® Audio with Navigation and App Suite, featuring JBL® GreenEdge™ speakers. Both offer the convenience and clarity of SiriusXM® All Access Radio. RAV4's front seats are engineered to yield in a controlled manner in certain rear-end collisions, helping to reduce the risk of neck injuries. We want you to enjoy your drive without worries. That’s why RAV4 comes with eight airbags, including our driver and front passenger Advanced Airbag System, driver and front passenger seat-mounted side airbags, front- and second-row Roll-sensing Side Curtain Airbags (RSCA), and a driver knee airbag and a front passenger seat-cushion airbag. 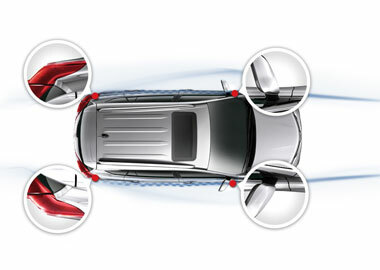 Standard on RAV4, the Star Safety System™ is a suite of six advanced safety features including Enhanced Vehicle Stability Control (VSC), Traction Control (TRAC), Anti-lock Brake System (ABS), Electronic Brake-force Distribution (EBD), Brake Assist (BA) and Smart Stop Technology® (SST). A new RAV4 comes with legendary Toyota durability. Over 90% of all Toyota RAV4s sold in the last ten years are still on the road.